The Alabama Crimson Tide is the top dog in college football and the top betting sites recognize. And I mean dog as in ‘Big Dog’ Glenn Robinson. Not as in underdog. That would be the Texas A&M Aggies. Alabama is No. 1 and TAMU is No. 22. But the divided between is even wider when it comes to the best online sportsbooks. 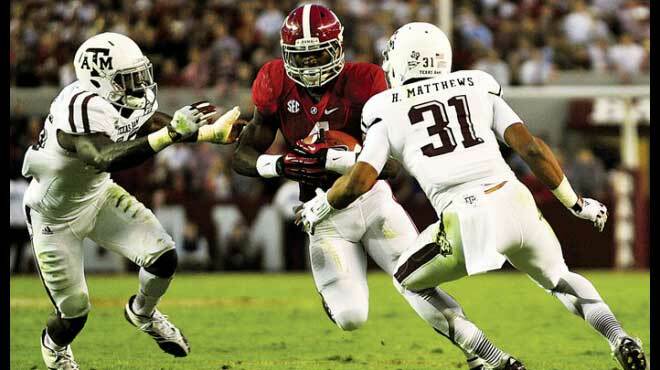 The Tide is a 26-point home favorite against the Aggies. This game is in a nutshell the reason that Texas A&M hired head coach Jimbo Fisher. TAMU is paying Fisher top dollar to bring them the head of Nick Saban. Figuratively. Though I don’t think he was what it takes (shoutout to Aerosmith). He is a Fisher, not a Hunter. In fact, according to 24/7 Sports, Fisher would vegan for a year to upset Alabama. The problem is, vegans are weak. Carnivores are strong. The Aggies proved they can hold their own against a highly ranked program. They covered against Clemson in Week 2 as 12-point road dogs. And mind you, TAMU got really close to pulling the upset. The Aggies outgained the Tigers 501 to 413 in total yards. Texas A&M also held an advantage of 25 to 14 in first downs and was in possession the football for almost 34 minutes. Starting QB Kellen Mond threw for 430 passing yards and three touchdowns. Speaking of which, if the Aggies have any chance of upsetting the top betting sites odds, is through the air. The Tide is a perfect offensive machine. And a near-perfect defensive one. ‘Bama’s secondary is allowing a tad over 200 passing yards per game. Including 218 to the Arkansas State Red Wolves. And 252 to Louisville. Alabama is 8-14 against the top betting sites spread against teams averaging at least 32 minutes of possession time per game. TAMU averages 36:36. All that being said, the Tide seems to be able to score at will. They piled enough points on Ole Miss to cover the 22.5-point spread almost twice. Alabama is intractable right now. UA is like the Hindu temple cars of Jagannath Temple in Puri, trampling down believers and non-believers alike. They crushed Ole Miss, and might go out of their way to crush you if you don’t take ‘Bama and the points. The only question is, whatcha gonna do, brother, when the Crimson Tide runs wild on you?